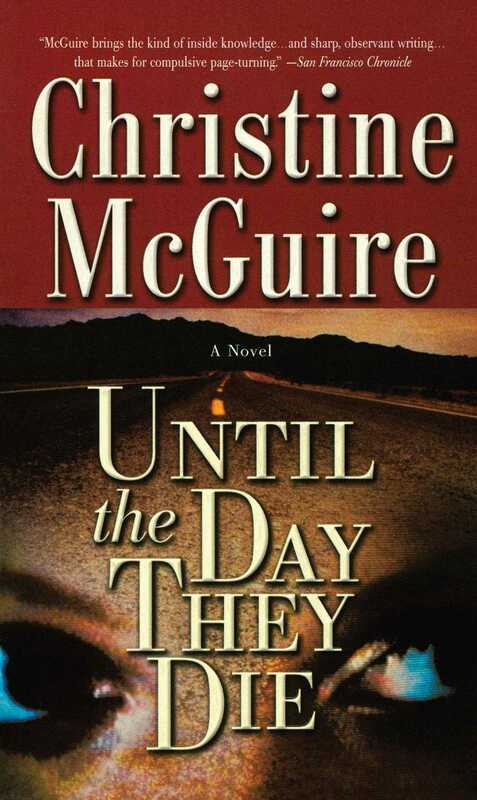 District Attorney Kathryn Mackay races against time to break up a kidnapping ring in this gripping new thriller by real-life prosecutor and New York Times bestselling author Christine McGuire. When an infant gets snatched from her wealthy Santa Rita County home, Kathryn Mackay and her former lover, Detective David Granz, are called in to investigate. Supplied with few leads and almost no help from the family, Kathryn takes to the airwaves, broadcasting the story nationwide on Larry King Live. But when babies start disappearing from birthing centers and bedrooms all over the county, she soon realizes things are much more complex than they seem. As Kathryn and Dave work to uncover the conspiracy behind the crimes, a shocking call from halfway across the country reveals a plot more widespread than they ever imagined. Filled with all the excitement and suspense of McGuire's previous page-turners, Until The Day They Die will keep you guessing until the very last page. The Fourth of July crowd lining Village Road was noisy, boisterous, and happy. The Stars and Stripes flew proudly on bicycles, baby carriages, street signs, and building facades. Some stood, some sat on folding chairs or the grass strip separating the sidewalk walk from the pavement, while the more adventurous perched on the roofs of their cars or tailgates of pickup trucks whose rear ends faced the street. Small children were hoisted onto their dads' shoulders, legs wrapped tightly around their necks. Older kids crouched in front of the adults, waving their little flags. "Here they come," Emma shouted excitedly to no one in particular. "Here they come." A true patriot at age nine, she waved the Stars and Stripes for emphasis. Faintly audible John Philip Sousa marching music preceded the first float as it crested the small hill near the shopping center. It carried the Laguna del Mar High School Marching Band, which on this occasion was definitely not marching. The ancient blue Dodge truck towing the float was decked out in red, white, and blue balloons and bunting. The all-girl wind section sat in front. Boys clad in identical red, white, and blue T-shirts immediately behind blared away on an array of trumpets, trombones, and tubas, while at the back of the float rode identically dressed students pounding away on drums and cymbals. If it wasn't perfectly performed, the march was at least played loudly and enthusiastically, and the spectators lining the early parade route expressed their appreciation by cheering, stamping their feet, and clapping their hands in time with the march. Not to be outdone, the drum majors and majorettes of the Española Middle School strutted in their maroon-and-yellow uniforms immediately behind the band in more-or-less perfect unison. No one noticed or cared about the occasional dropped baton as the procession approached the railroad underpass. Immediately after the drum corps an antique tractor wheezed and chugged along pulling an equally old rubber-tired wagon stacked with gaily decorated apple crates on which sat pretty high-school girls dressed as Uncle Sam throwing kisses to their appreciative audiences. Two elderly men wearing overalls, checkered shirts, and straw hats sat high on the wagon's driving bench. One had a piece of straw clamped in his teeth. Following the wagon, firefighters of Laguna del Mar County Fire District Station Two crept along on Engine 3552. The fire engine -- gleaming red and spotlessly clean -- sounded its siren periodically to the delight of the younger spectators. One of the fully regaled firefighters clinging from the engine spotted Dave Granz and pointed his finger at him, cocked his thumb, and fired an imaginary round straight at Granz's chest. "Hey, Granz -- bad guys taking today off?" he shouted above the din. "Nope," Granz shouted back, "but the DA's office is." "I guess so! The lead investigator's out playing, and I see they let the Top Gun prosecutor out for fresh air, too," he shouted back, acknowledging Kathryn Mackay -- Kate to those who knew her -- with a friendly smile. The fire truck disappeared around the turn into the old section of the village. "Mom, look!" Emma yanked on Kathryn's arm and pointed to the road where a keeper led a small herd of serene, haughty-looking animals down the middle of the road. "Llamas! I heard they were going to have llamas. Aren't they beautiful, Dave?" Dave struck a thoughtful pose, scratched his chin, and studied the strange animals who could best be described as a curious and not totally successful cross between a camel and a goat. One was a whiskey-brown color and the other off-white. "Don't know I'd call them beautiful exactly. Interesting, maybe. Next thing you know they'll be bringing elephants to our parade. It's downright un-American, I'd say." "Oh Dave," Emma squealed in delight, knowing Dave was, in his terms, 'yanking her chain.' "We shoulda brought Sam. I saw a booth where anybody who enters their pet in the parade gets a prize and a ribbon." Sam was Emma's golden Lab, the dog Dave gave her right after Emma's father was killed in a courtroom shooting. She and Sam were inseparable, Sam believing he was a sixty-five-pound lap dog, and Emma indulging his delusion. "Too late now, sweetie. Maybe next year," Kathryn answered. Changing the subject, Dave's attention turned to the area near the parade's starting point. "I'll bet Hal's having a great time up there sitting on the back of that Cadillac convertible," he said to Kathryn, only partially in jest. Kathryn smiled. Her boss, District Attorney Hal Benton, had reluctantly agreed to preside as grand marshal of the Fourth of July Grand Village Parade and Extravaganza, proudly referred to by its organizers and local citizens alike as the World's Shortest Parade. It began in the parking lot of the Wells Fargo Bank at the intersection of Village Road and the freeway interchange, wound about a mile through Laguna del Mar and terminated at Village Park. No one associated with the event took themselves very seriously, but everyone took the parade and the ensuing festival very seriously -- it was an important regional event, and not one to be missed if you wanted to mingle with the movers and shakers. "He'll cope," she replied. "He'll have to. Besides, where else could he get all this free publicity?" Dave, Kathryn, and Emma had arrived at the parade site early to assure a prime spot to observe the action. Waking at five-thirty in the mornings was such a pattern for Kathryn that she never considered it unusual anymore. Emma, however, preferred to sleep late and lounge in bed watching cartoons on her own Panasonic TV-VCR which occupied the place of honor on the dresser in her bedroom. The TV-VCR, an indulgence from Kathryn, was an effective babysitter when Kathryn spent hours on the phone with police or other prosecutors. By the time Emma awoke each morning, Kathryn had normally completed her morning household chores and spent half an hour on either the StairMaster or stationary bicycle. Their routine was to have a light breakfast and orange juice together, chatting about the matters Emma found important, before leaving the house for school and work. This morning was different. They walked up the short, steep hill to meet Dave at the pancake breakfast being served by the volunteer firefighters alongside the old Seacliff Hotel outside the entrance to Village Park. They found him standing outside by the coffee bar. Kathryn had smiled inwardly, knowing that Dave couldn't start the day without his "caffeine kickstart." He was wearing a black T-shirt that said "Turn on Your Own Thunder" in bold red letters over the Harley-Davidson logo, with Levi's and black Nike Airs. With his beach-bum blond hair and youthful good looks, he couldn't have looked less like a cop. But, as an experienced investigator in the District Attorney's office, that's what he was. Kathryn, as senior trial attorney prosecuting only the most serious felonies, harbored a deep and abiding respect and gratitude for Dave Granz's professional skills. She also cared deeply about him personally. "Hi gang," he greeted them, snapping to attention and saluting Kathryn, who wore white jeans and a blue T-shirt with an American flag silk-screened on the front. "You guys ready to eat? I'm starving." "What kind of pancakes do they have?" Emma inquired. She loved pancakes. "Well, let's see," Dave thought aloud. "They have buttermilk pancakes with maple syrup. Or you can have buttermilk pancakes without maple syrup. Or you can have maple syrup with buttermilk pancakes. Take your pick." Emma only ate pancakes so she would have someplace to pour her maple syrup, and Dave knew it. "I think I'll have buttermilk pancakes with maple syrup. Lots of syrup, please." "Your wish is my command." He turned to Kathryn. "And what is your desire, ma'am?" "I'll just have coffee, I think." Emma rolled her eyes at Dave conspiratorially and pointed at her hips. "She thinks pancakes end up in the wrong spot. I'll eat hers." "E-m-m-m!" Kathryn arched her eyebrows in feigned indignation. She loved it when the two of them ganged up on her. Her two favorite people together. After they ate, they picked their spot alongside the road opposite the shopping center, just before the railroad underpass, from which they now watched the parade. Dave had brought a couple of folding chairs -- Kathryn reclined in one, while Dave shared his with Emma. Kathryn had brought a thermos of cold orange juice, but no one was interested in it. As another band strutted past in colorful uniforms playing "The Battle Hymn of the Republic," Kathryn inquired rhetorically, "How did this thing get started, anyway?" Right then a clown sauntered past with his spotted mongrel dog who wore a miniature harness and pulled a red rubber-tired Radio Flyer wagon. Another man costumed as Paul Revere roared past riding a mini bike trailing an obnoxious cloud of exhaust. Dave, the local resident historian, began, "It started back in 1962. Some local ladies won a zoning decision barring the building of a cement plant near here. It was just before the 4th, so they thought a parade was a good way to celebrate. Back then it was even smaller than it is now, But it sorta..."
"It just growed," Emma interrupted, emphasizing her point, as she often did, with intentional bad grammar. She was waving to Grandpa and Grandma riding on a stack of straw bales in the back of a Model A Ford truck. A banner on the side of the truck read "Born on the Fourth of July. Grandpa -- July 4, 1923. Grandma -- July 4, 1926." The straw bales were entirely surrounded by fresh fruits and vegetables arranged to spill out of large baskets. Grandpa and Grandma waved back at Emma. "Boy, if the Rose Parade organizers could see this," Kathryn mused. "They'd die laughing," Dave responded, "but I'll bet we have just as much fun." A 1957 red Cadillac convertible crawled past, its driver wearing a Bill Clinton mask. A banner on the windshield read: "Whitwater? I cain't even spel it." Hal Benton smiled and waved from his perch on the back deck. He flashed a wink to Emma and a thumbsup to Kate and Dave. In the middle of the parade rode a squadron of two dozen or so Harley-Davidson motorcycles flying banners declaring their membership in the local chapter of the Harley Owners Group. The machines -- mostly black, and all cleaned and polished to perfection -- crept along so slowly it seemed impossible for them to remain upright. The big, powerful engines roared as their riders cranked the throttles to impress the bystanders. The riders represented a cross-section of motorcycle enthusiasts. Some wore black leather vests, black T-shirts, black Levi's, and black boots, and sported long hair, beards, and mirror shades. Others, many riding "dressers," were a bit more sedate. But they all smiled and waved, especially at the kids along the route who were, Kathryn observed, properly impressed and envious. Dave was in obvious pain. "Aren't those V-Twins music to your ears?" he asked Kathryn. "Can I have one for Christmas? I'll take a small one to start -- a Sportster'll do fine." "I thought you were saving up for another new Jeep." "Yeah, I guess I am." He grinned. "But I'll tell you something. Those scooters bring out the cowboy in me, and those guys are the last of the American cowboys. Besides, I was thinking maybe I'd find one in my stocking if I came over to your place this Christmas." Hearing all this, Emma couldn't resist. "Oh, Dave, you're too old for that stuff." "Thanks a lot. See if I take you for a ride." For the next forty-five minutes or so, the parade rolled past: the Rotary Club, the Boy Scouts, and a red Miata with the top down carrying George Washington and Betsy Ross. Next, a little guy on a tricycle passed by towing a two-wheeled wagon with a little girl and a huge bunch of red balloons which looked capable of lifting the wagon off the ground. They were followed by a row of vintage cars in various stages of restoration. The last float, bearing the sign "End of Parade" and carrying a banjo band and barbershop quartet singing "Down by the Riverside," finally inched past the spot Dave, Kathryn, and Emma had claimed. Bringing up the rear, not official but equally enthusiastic, came a group of preteenagers on skateboards, bicycles, and rollerblades. Finally, Dave picked up the chairs and folded them. They followed the crowd under the railroad bridge to Village Park, where the bunting-draped stalls, booths, and sideshows were set up in the parking lot. It looked like a carnival midway, with the aroma of hot dogs, hamburgers, onions, pizza, and hot grease mixed with the pungent tang of barbecue fires being stoked up to cook chicken and steaks. Nearby, the sounds of a bluegrass band had everyone tapping their feet. Too full to eat, they wandered around for awhile, although Dave had extracted Kathryn's solemn promise that they could eat "carney food," his favorite cuisine, for supper. They shopped the arts and crafts booths. Then, while Emma tried to win a stuffed animal at the Coke-bottle ringtoss, Dave's pager beeped. "Oh, crap," he moaned as he checked the number display. "County Comm." At that moment, Kathryn's pager also sounded and hers, too, was requesting response to County Comm. Kathryn was always on call for homicides and other serious crimes, and whenever she was on call, she requested Dave as her investigator. She knew it was serious, or they wouldn't be paged. "Why don't you call us in," she asked Dave, "while I go break the news to Em. She's going to be really upset. You know, except for Christmas, the Fourth is her favorite holiday." "Okay, babe." Dave wandered away in search of a pay phone. "Meet me here. I'll be right back." When he located them about five minutes later, Emma was consuming a huge chocolate ice-cream cone, her mother's only effective means of apology. It wasn't working entirely, Dave noted, judging by the frown on Emma's face. "Where's mine?" Emma held it out to him for a lick but didn't smile. Kathryn waited in anticipation. "House fire in Mission Heights," he reported. "A bad one. Looks like arson." Before Kathryn could ask why they were being called out for a house fire, he continued. "They recovered a body from the site. Looks like more than an accidental fire. We're supposed to meet Dr. Death -- woops, sorry -- Dr. Nelson at the morgue." Morgan Nelson was a forensic pathologist who functioned as the coroner. Nelson was the best. "M-o-o-o-m! Do you have to go? This is a holiday." Emma protested, but with little hope of winning her case. She'd done this many times before. "You know I do, sweetie; I don't have any choice, I'll come home as soon as I can, and we'll go to the beach after dark to watch the fireworks. I promise." Disappointed, Emma accepted this as the best she could expect. "I'll go get my car," Dave suggested. "I'll pick you up here. Do you want to ride down together, or do you want to drive your own car?" "No, I'll drive my own. But you can take us home. I'll call Ruth to watch Em, then meet you there." She saw a strange look on Dave's face. Noticing the direction he was looking, she realized what was bothering him. They stood in front of the old turn-of-the-century Seacliff Hotel, a local landmark and historical structure recently renovated and converted to a restaurant and bed-and-breakfast by an English couple. Just behind it lay the parking lot where, a few years ago, a serial killer dubbed by newspapers the Gingerbread Man had lured Dave to a meeting and almost killed him with a medical scalpel. Kathryn no longer noticed the faint scars on his face and neck, although they were plainly visible if one looked for them. "Oh, Dave, why did you park there? I know it still bothers you." He shrugged with more indifference than he felt. "Only place to park when I got here. Doesn't bother me except I get mad as hell. Mad at myself for being so stupid. That's all. Don't worry about it." Turning away to hide his feelings, he headed off to retrieve his car. Jesus, he thought, maybe I ought to buy one of those Hogs and ride away. Be easier than this and a lot more fun.